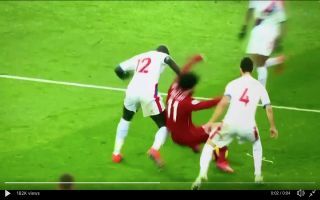 Liverpool superstar Mohamed Salah was blasted by football fans this afternoon after footage showed him appearing to dive in the first half of Liverpool’s clash vs Crystal Palace. Just minutes after Crystal Palace took the lead it seemed as though Mohamed Salah was clutching at straws when it came to getting his side back into the tie and the Egyptian went down like he’d been shot after a battle with ex-Liverpool defender Mamadou Sakho. Salah has come under fire in the last month for his theatrics and some Premier League fans were deeply disappointed with the star’s antics this afternoon. It’s pathetic, lost count how many times he’s dived this season. The FA have to do something!